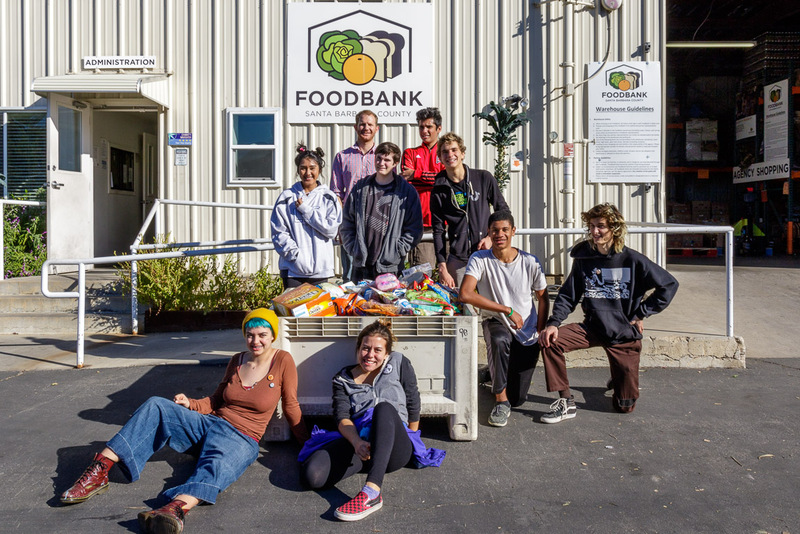 GSA Graphic Design class with a bin holding 837 pounds of food donated by staff, students, parents, and the Santa Barbara community. Today our Graphic Design class took a short field trip to the Foodbank to donate the all the food we collected‬. The final tally was 837 pounds, including 699 cans! Way to go GSA and Santa Barbara! Thanks to all of our students, their families, Trader Joe’s, and the Santa Barbara neighborhoods for donating so much food! We’ll do it again next year! On Friday we finished the mosaic. The students chose to build a Yin and Yang symbol. This Thursdays they’ll breakdown the mosaic and deliver almost 800 pounds of food to Foodbank of Santa Barbara. With almost 700 cans collected, we’ll begin building the mosaic Thursday afternoon (Dec. 10th). Check out our Twitter and Instagram feeds for rapid updates. Also, big thanks to the Trader Joe’s stores on De La Vina and Milpas for donating sixty-two cans today! Thank you so much for taking part in our food drive. The upcoming holidays are a time to be thankful for everything we have, and to help make life easier for those in need. As part of our student curriculum, Garden Street Academy is collecting canned food and other non-perishable food items. 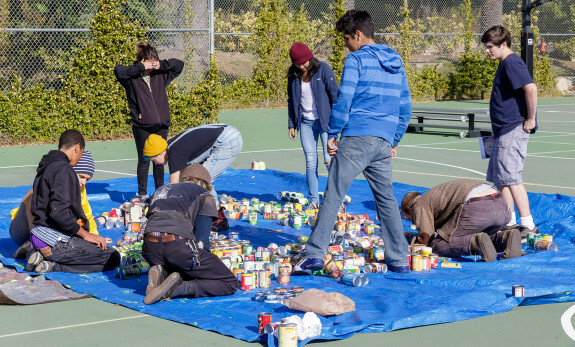 Our Upper School art students will use the cans to construct a large mosaic image. We’ll capture the construction with a time-lapse video, and photograph the finished piece from the air with a drone. They are currently in the process of designing the image to serve as the basis of the mosaic. 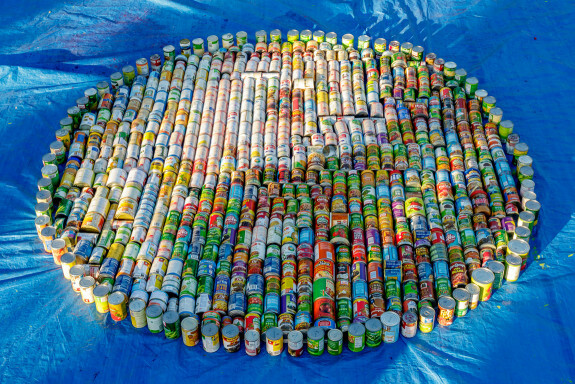 The challenge will be to adapt their design to the unpredictable palette of colors received from the donated cans. Our Middle School students will use spreadsheets to inventory the donations, track nutritional content, collection rates, and learn about the quality of food collected. Who will get the food? After we’ve built and documented the mosaic, the food will be donated to Foodbank of Santa Barbara. Please donate food that has not expired. The Foodbank has to check every item and then discard those that can not be distributed. Canned fruits, vegetables, beans and meats are ideal because of their nutritional and/or high protein content. How many cans do you need? 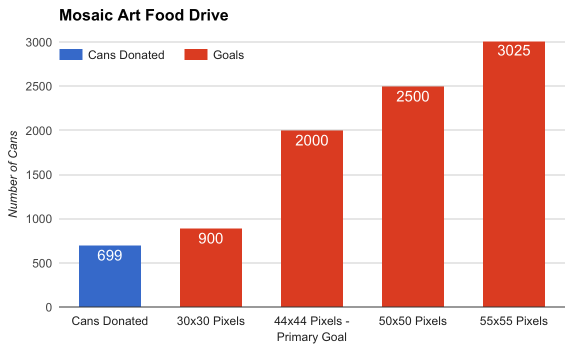 Our initial goal is at least 2000 cans by November 30. That gives our students a “canvas” of about 44 by 44 pixels. They’d love to get even more cans to have a larger canvas and a more colorful palette. How do I get cans to you? Drop cans off yourself – Parents of our students can drop off at the sign-in/out table or in the main office. The public can drop off at the main gate which is adjacent to the back side of Santa Barbara Mission. Community grocery bags – We’ll be dropping off reusable grocery bags at homes throughout the community. If you receive one of these bags, please ask your neighbors to help you fill the bags. Leave your filled bags on your porch and we’ll come pick them up for you (see timeline below for pickup dates). Donate money – If you want to contribute, but don’t receive a community grocery bag or if you live outside of Santa Barbara, please donate money to our GoFundMe campaign and we’ll buy the cans for you. Nov. 11th – 12th – First round of community bags delivered to homes. Nov. 18th – First round of community bags will be picked up. Nov. 20th – Second round of community bags delivered to homes. Nov. 30th – Second round of community bags will be picked up. Nov. 30th – Dec. 4th – Food sorting and planning of mosaic installation. Dec. 1st – Purchase cans with GoFundMe campaign funds. Dec. 7th – 11th – Mosaic installation and documentation (weather permitting). Thanks for helping to make the holidays a bit brighter for everyone in Santa Barbara.